It is with great love and gratitude for each of you that we send you the latest edition of our newsletter. 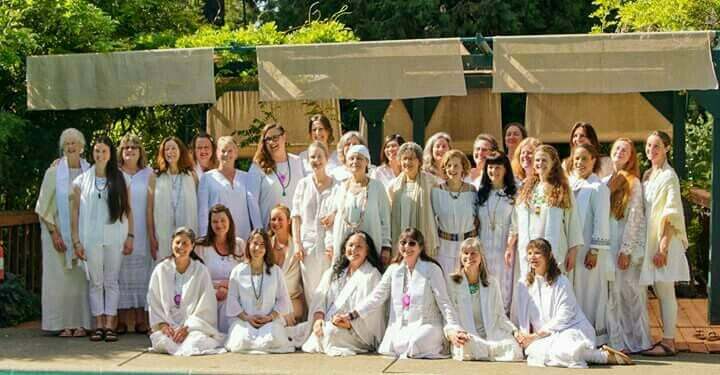 It has been a full and potent time at the Center for Sacred Studies, and we are looking ahead with great enthusiasm as more offerings are launching and the web of the Mother continues to spread across the globe. May you feel inspired today to spread the prayer of love, peace and unity that connects us all even just a little bit further than yesterday. Together, we are transforming our world for the better. Ministers of Walking Prayer 2018! The Center for Sacred Studies ordained 22 new Ministers of Walking Prayer in April. These amazing ministers create a network totaling 227 Ministers around the world. We give thanks for all those that contribute to the program from the Instructors, the Elders, the Mentors, the Weavers and all who hold this program to make this offering. Thank you to Hanayo, Sonja, Margin, Valerie, Trish and so many of our Ministers!! We are honored and inspired by each of you! Our dear Elder, Rev. Judy Lay is offering a sweet and intimate opportunity to tap into our creative gifts. Please see details below and get in touch with her if you’re in the area and feel stirred by her offering. Come lay your hands on wool and offer prayers as you create a beautiful felted altar cloth. Wet felting is such a beautiful process and no need to have any experience in this ancient craft. There will be a blessing of hands ritual before we begin, and I will share the ancient stories of how this craft came to be. Bring your songs from all traditions to sing us along as we make these pieces. $50/workshop and $20 for materials. And it is Kayumari’s 23rd Birthday!! A day to support yourself and those you love while supporting the Center for Sacred Studies. Maitri Breathwork™ developers, Jyoti and Russell Park, will join with Darlene Hunter and other certified Maitri Facilitators and assistants to offer a Global Breathwork Fundraising event. In different locations around the world, facilitators and assistants hold a day of breathwork, giving their time, love and energy to support your healing. The breathwork fee will be donated to the Center for Sacred Studies. “In spite of the disharmony around us, you must be so synthesized in your choices that your tone, your note, your living mandala vibrates with uncompromising clarity. You who share the vision will hold the pattern of the world in peace; a world which creates an environment in which all life forms can come to fruition, a world in which spirit is recognized as the essence of life and all life is honored, a world in which creative expression is celebrated, one in which wisdom guides knowledge and justice is the ground, a world in which the Universal Christ is born again and again. It is an exquisite joy to be part of the bringing forth of such a mandala for planet Earth. You first must create this synthesis within yourself, releasing and blessing every single step that has brought you out of the darkness. You must remain steady and not look back. The shift into higher synthesis is as close as your next breath. Our Children are the new Leaders! Join us in holding sacred space for our young people to create and co-exist in their every day actions and personal connections. During our time together we will be exploring and co-creating the world in which we want to live, what we think, what we say, what we believe, what we do, and the attitude we have to create our reality. As more children and teens come, we are offering tracks for our younger leaders and for our teens. In this time we are in, it is important to listen to the wisdom of our young elders in order to create the most inspiring, joyful and love-filled experience possible for our Communities and our World! CSS Earth & Spirit Online Store! Our intention is to bring you Sacred items and tools of healing that connect us even deeper to the Divine. In the spirit of collaboration and reciprocity we foster relationships with many Artisans from our local community as well as different traditions from around the world. The Earth & Spirit Store at the Guerneville Center is proud to collaborate with CSS Rev. Indigo, who is the founder of the Zahra Foundation. We are now carrying some of the beautiful hand made items from Egypt. The beautiful bags are made from plastic bags. Zahra Handworks Foundation (Zahra) facilitates educational and enrichment opportunities focused on the value and importance of creating with one’s own hands, especially when made from re-purposed and reclaimed materials, and the positive ecological effects this can have on the environment, culture, and family. Say rather, “I have met the soul walking upon my path.” For the soul walks upon all paths. Share the post "The Town Crier – A Newsletter for the Center for Sacred Studies Community – MAY 2018"